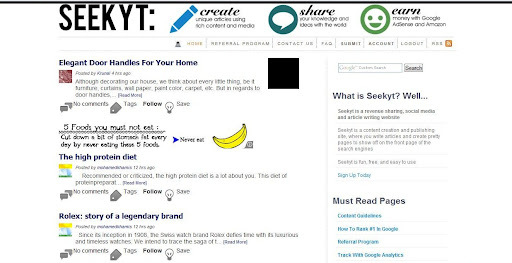 Seekyt is an upcoming content sharing website where author's can make some some passive revenue through Google Adsense. Seekyt only accepts unique content of length 2000 characters or more. Your 3 articles will be moderated before they are published to ensure that it is not spam. But, provided your article is unique and doesn't have too many spelling errors (don't forget to use the Seekyt spell checker tool) your articles should have no issues whatsoever with their editorial system. You earn revenue through Google Adsense ads placed around your article, but you must have a verified Adsense account to earn from this site. Seekyt offers 70% Adsense ad impression to the author and is significantly higher than most of its more established competitors like Xomba (60%), Hubpages (60%), Triond(50%) and Bukisa (60%). In addition, you can also earn through your Amazon Associates account.In additon to this, Seekyt offers a whopping 25% referral bonus! Seekyt also allows you to place a limited number of dofollow backlinks to your articles and so may be a good place to market your blog or website or even try and sell your products. The first thing that struck me about Seekyt is how active their network is. Your article is sure generate some nice comments and get tweeted, f-liked and shared within just hours of going online and that is a big advantage Seekyt has over many more established content sharing sites. Seekyt is also one of the very few content sharing sites that actually allows you to chose your page layout (placement of adblocks etc.) and this makes the site very flexible for content writers. However, on the downside Seekyt is a pretty new and site and so it might take a while before you actually start receiving tons of targeted search engine traffic or get a high page rank. But, the decent Alexa rank (for a rather new site) does prove that Seekyt has quite a bit of potential and it might be a good idea to get in the ground level of so promising a venture. Join Seekyt now!